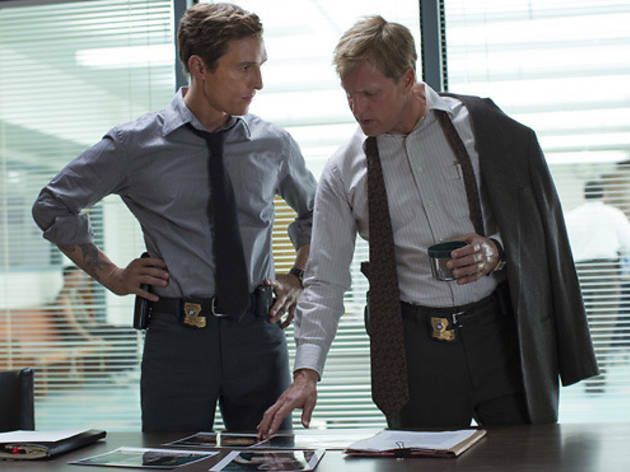 HBO's new crime series True Detective is a fabulous showcase for Matthew McConaughey and Woody Harrelson. True Detective airs Sunday nights at 8pm on HBO. In the current landscape of television drama, the "detectives investigating the grisly deaths of young women" story is one we're pretty worn out from. So it’s surprising that True Detective, with its initial murder tableau ripped straight from the first episode of NBC’s Hannibal, manages to overcome the tired formula with a complex narrative structure and brilliant acting. 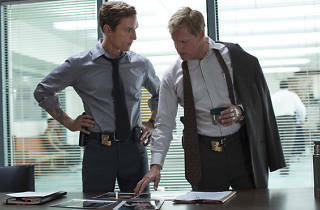 Tackling a Louisiana murder investigation that spans 17 years, True Detective adopts a storytelling structure reminiscent of How I Met Your Mother, as Detectives Marty Hart (Woody Harrelson) and Rust Cohle (Matthew McConaughey) are questioned, a few days apart, about a case they worked in 1995. As the two detail their recollection of the investigation, the audience is transported back in time, though not always in chronological order. It's clear from the way they deliver certain aspects of the story that both men have changed significantly in that time, without either of them ever having to detail exactly how that may be. The case originates when the body of a young woman is found naked and bound to tree with deer antlers attached to her head, strange marks painted on her back and bundles of nearby brush lashed into pyramids around her. The odd nature of the crime scene causes many in the police department to believe that the killing is related to Satanic worship. Rust, an enigmatic man with a wounded history, disagrees, deducing that the victim was likely a prostitute and that this murder has the signs of a ritualistic serial killer. He predicts that there will be more to follow and, perhaps, there already have been others. Marty laughs off the speed at which his partner facbricates these theories, but they do turn out to be accurate. As the pair attempts to find links to other possible victims, they also run the risk of losing the case to a special task force that the Governor has implemented to combat anti-Christian crime. The crime story in True Detective is its worst feature, offering little more than we've come to expect from countless other investigative dramas like The Killing or The Bridge. What makes this series utterly fascinating is watching McConaughey and Harrelson unravel their characters' histories while discussing the case. Piece-by-piece, they offer tidbits of information that fill in the 17-year gap that's lead them to where they sit. McConaughey certainly gets the showiest transformation as he goes from a haunted but clean-cut, recovering alcoholic in 1995 to to slovenly mess in 2012, insisting a detective run out and get him a six-pack in the middle the interrogation. He's a man plagued by tragedy and brilliance, unlike anything McConaughey has tackled before, even in his recent career resurgence. Harrleson's Marty is a more straightforward guy who frequently comes off as a bit of a cad in the '95 sequences, but the actor really shines in the interrogation scenes when he manages to communicate years of history with a well-placed silence. True Detective is a fascinating portrait of two broken men that offers its lead actors an amazing opportunity to showcase their talents.